Washington, DC – Earlier this morning, President Obama delivered remarks at Andrews Air Force Base on offshore energy exploration and production, and what a scene it was. While many newspapers and cable news pundits cheered the announcement as a positive development, we at the Institute for Energy Research caution lawmakers, the media, and the American people from rushing to conclusions until all the facts are on the table. This is a huge step backward for America’s energy security. “America’s offshore energy resources belong to the American people. Not a company, not a special interest, and not a single administration. And a clear majority of the American people supports the commonsense strategy of producing more oil and gas here in America. Unfortunately, today, and to our economic detriment, the President once again ignored the will of the American people. 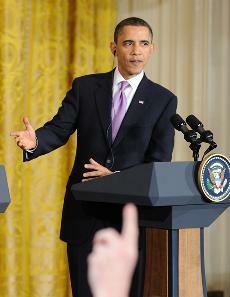 “Just as he did in his State of the Union Address, President Obama cited the imperative of offshore energy exploration. But words alone will do nothing to move this country’s energy policy forward in a meaningful way. It’s similar to his announcement on nuclear loan guarantees—the President talked a good game, then eliminated funding for the only nuclear waste repository in the nation. “In 2008, when Congress and then-President Bush retired the decades-old moratorium on the safe and environmentally sound practice of producing energy miles off the Atlantic and Pacific coasts, the American people, and our economy, scored a huge victory. Unfortunately, what President Obama outlined today puts part of that moratorium back in place. Kicking the energy can further down the road is not a change in policy. Cancelled five lease sales off the Alaska coast that were planned over the next 2 years. One of the areas is estimated to hold up to 77 billion barrels of oil, or more than 3 times US reserves.